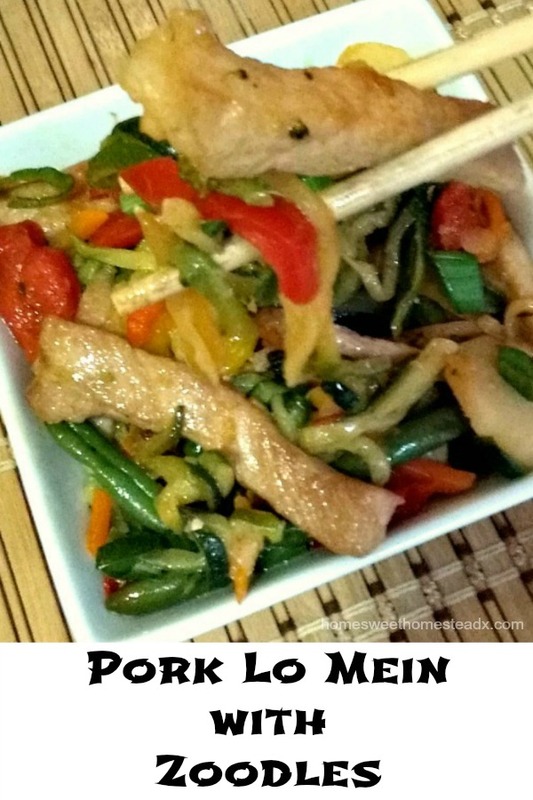 No need to order take out when you can make Pork Lo Mein at home. You wont believe how easy it is! Imagine being able to sit down and enjoy this popular Asian meal in about 30 minutes. And the best part? It's low FODMAP! My doctor put me on a low-FODMAP diet about a month ago for health issues, and it seems to be working very well. At first I thought it was pretty restrictive, but once I started experimenting with recipes, I discovered you can still make most of your favorites, you just have to be a little creative with the ingredients! Like this Pork Lo Mein with Zoodles. 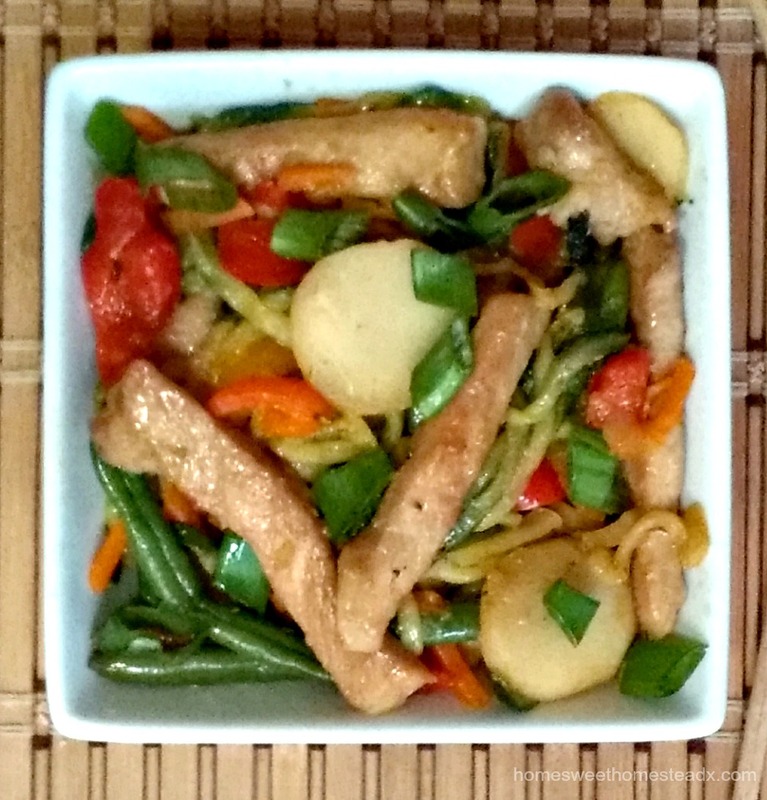 Asian style stir-fries are one of my favorite type of meals. They're quick, easy, and loaded with good for you vegetables. 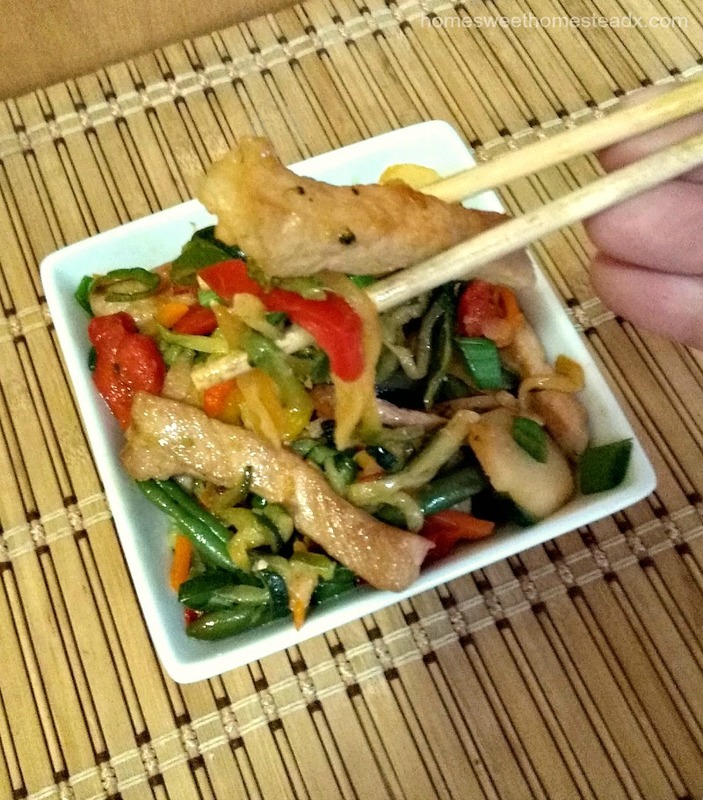 When I saw this month's ingredient list for the #ImprovCookingChallenge was Pork and Ramen, I knew it was the perfect time to come up with a low-FODMAP version of one of my favorite stir-fries, Pork Lo Mein. It wasn't that difficult really, all I had to do was make sure I used low-FODMAP vegetables, use zucchini noodles (zoodles) as a gluten free substitution for the ramen, and avoid garlic. Yep, sadly garlic is a no-no on the diet. But wait, why is garlic-infused oil part of this recipe then? Typically garlic is a low FODMAP diet no-no. But, garlic infused oil, as long as you don’t eat the garlic is okay. This is because the FODMAPs in garlic (fructans) are water soluble so they will not leach into the oil. YAY! I hope you’ll give this recipe a try! And be sure to check out all of the other Ramen and Pork recipes by fellow bloggers in the links below. Place the pork strips into a bowl, and mix well with one tablespoon of the soy sauce and the cornstarch. Set aside. In a separate small bowl, combine the other two tablespoons of soy sauce, with the sesame oil, salt and sugar. Set aside. In a large skillet or wok, heat 1 tablespoon of the garlic-infused oil over medium-high heat. Once oil is shimmering, add the pork strips and cook, stirring frequently until no longer pink and lightly browned, about 10 minutes. Set the pork aside and place the skillet back over medium-high heat. Add the ginger and the other tablespoon of garlic-infused oil, and cook until fragrant, about 1 minute. Add the broth and stir-fry vegetables, stirring frequently until crisp-tender, about 3-4 minutes. Add the zucchini noodles and toss. Add the reserved sesame oil mixture and cooked pork, and cook for 3 minutes more, or until the zucchini softens to your preference. Serve immediately garnished with chopped green onion tops. I *heart* zucchini noodles. But if you would prefer actual noodles, just switch out the zoodles in the recipe for cooked gluten free ramen noodles. Check out the yummy Pork and Ramen recipes my blog friends came up with! The #ImprovCookingChallenge is a monthly blogging event where two ingredients are assigned to a month. Bloggers can make any recipe they like as long as it features the two ingredients. Would you like to join us? 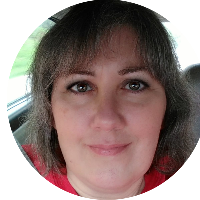 Please visit Nichole's blog for more info. If you’d like to see previous creations, check out our Pinterest board.